Polyester plate lithographs can convey the lightness of touch and a likeness to the medium of drawing that stone lithography is known for, without the toxic processes. The word lithography comes from the Greek lithos meaning stone and graphein meaning to write. In traditional lithography the artist literally works and pulls prints from a limestone matrix. Lithography is a planographic process, the matrix is flat and contains no physical features (such as etched or engraved lines) that will pass on any information to the prints. Polyester plate printing started as a low cost, yet professional form of commercial offset lithography. This non-toxic medium, also known as Pronto Plate Lithography, is capable of reproducing the full spectrum of lithographic marks such as: hand drawn brush strokes, ink wash, texture, crayon and pencil marks, and is equally well suited for digital imaging. The plates can be drawn on directly with sharpie or ballpoint pen, pencil or traditional lithographic crayons, and washes can be created with toner, Speedball screen filler or india ink. The plates contain tiny pores that accept and hold water. By covering those pores with a waterproof substance the artist creates an area that will accept ink. in multiple passes until the desired density of ink has built up. The plates may be printed on etching presses or even by hand by placing the inked plate in contact with well dampened paper, and rubbing thoroughly from the back with a wooden spoon to make the impression. Red Dory, oil and screenprint on panel, 11" x 14", 2011. Pork, oil and screenprint on panel, 12" x 16", 2011. Cow Moose in Swamp, oil and screenprint on panel, 16" x 12", 2011. Teamwork, oil and screenprint on panel, 12" x 16", 2011. Observation, oil and screenprint on panel, 16" x 12", 2011. Good Neighbours, oil and screenprint on panel, 24" x 12", 2011. Rupertsland Migration, oil and screenprint on panel, 24" x 12", 2011. 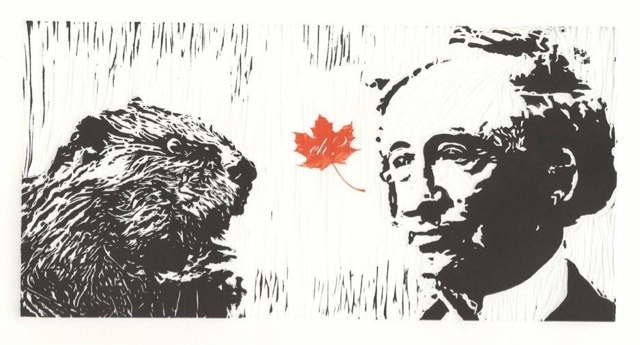 Encounter on Scotia Street, oil and screenprint on panel, 24" x 12", 2011. Patience, oil and screenprint on panel, 24" x 12", 2011. Longing, oil on canvas, 24" x 30", 2012. After The Storm, oil on canvas, 14" x 11", 2011. Grazing, oil on canvas, 14" x 11", 2011. Sunset, oil on canvas, 14"x 11", 2011. On Guard For Thee, oil on canvas, 26" x 32", 2011. AWOL, oil on canvas, 16" x 18", 2011. Clear Lake - Early Summer, oil on canvas, 8" x 10", 2011. Mowbray, oil on canvas, 14" x 11", 2010. La Riviere, oil on canvas, 14" x 11", 2010. Hand Drill, oil on canvas, 24" x 36", 2010. Chicago, oil on canvas, 24" x 18", 2010. Wrenches, oil on canvas, 18" x 24", 2010. Belt Sander, oil on canvas, 16" x 12", 2010. Bevel Square I, oil on canvas, 18" x 18", 2009. Bevel Square II, oil on canvas, 18" x 18", 2009. For Domestic Use Only, oil on canvas, 30" x 39", 2009. Model 310, oil on canvas, 30" x 30", 2009. He Made His Mark, oil on canvas, 24" x 16", 2009. Thin Blue Line, oil on canvas, 16" x 16", 2009. Stanley No. 2, 18" x 36", oil on canvas, 2009. Farewell to Craftsmanship, 24" x 30", oil on canvas, 2009. Graham: I have a long-standing interest in the natural and human history of Canada, and the “idea” of The North and our place in it as Canadians. Through my work I enjoy exploring, often with humour, some of the myths/truths of Canada. The work in this show had its origins in the winter of 2010-2011 with my etching Waiting For The Thaw, which was intended to commemorate the Year of the Rabbit. When the Winnipeg region received some early substantial snowfalls, I began to consider their impact on the upcoming flood season. This lead to an increasing sense of anxiety on my part, and I came to question the wisdom of living on a floodplain. Why would humans put themselves in harms way? Was it ignorance, blind faith in technology, or just a series of historical coincidences that kept us tied to this city sitting at the confluence of two flood prone rivers? I then began to consider the native wildlife of this region, and to recognize that they would have existed for thousands of generations here, seemingly in harmony with the natural cycles of the Red and the Assiniboine. What possible lessons could we learn from them? ‘The Flood’ series celebrated the common sense, perseverance, teamwork and patience of the animal world. These are attributes that we; the self proclaimed, most highly evolved race admire; yet we continue to falter in their achievement. Three years later we, along with most of Canada, have just emerged (well not quite at time of writing) from a particularly long, cold and snowy winter. Once again I have allowed the animals to return to our city streets to share with us in our northern experience. Peter Graham lives in Winnipeg. He has a B.F.A. Honours, Printmaking, University of Manitoba. Please drop by my studio on Friday, April 4th, 2014, from 5pm - 9pm for First Friday. I will be showing my new series of screen prints Waiting for the Thaw. If you are in the Hamilton area be sure to check out this show at centre . I, along with other Martha Street Studio artists, have work in the CT-International Print Biennial which opened Oct. 25th and runs until Nov. 30th. 'Crime Minister Harpolini', Peter Graham, linocut on paper, 6" x 6.5", edition of 25, 2013. Below is my first attempt at creating a linocut stop motion animation. It will be projected, along with the creations of my fellow artist/co-workers, in the windows of Martha Street Studio tomorrow night (September 28th, 2103). LOOPERS is Martha Street Studio's contribution to Nuit Blanche celebrations in Winnipeg. Two of the studio windows will be transformed into projection screens and the linocut animations will loop continuously throughout the night. 'A National Dream' Peter Graham, 12" x 6", linocut and screen print on paper, edition of 25, 2013. Steal This Poster is a campaign to get fine art prints and Martha Street Studio into your home and onto your walls! By placing posters around Winnipeg's historic Exchange District, we encourage you to take one and send us a picture of it in your home. Rupertsland Migration - Peter Graham oil and screen print on panel, 24" x 12", 2011. My work, Rupertsland Migration, has been purchased by the organizers of the 3rd Winnipeg Timeraiser where it will be available to be bid on in increments of volunteer hours. The successful bidder will have 12 months to complete his or her volunteer pledge after which they will become the owner of the piece. The 3rd Winnipeg Timeraiser will be held on Thursday May 30th 2013 at Manitoba Hydro Place. The Timeraiser is part volunteer fair, part silent art auction and part night on the town. Throughout the evening meet with different agencies and match your skills to their needs. Once you have made your matches, you are eligible to bid on artwork. Registration is underway for my next class at Martha Street! Looking to etch lines lines that look like pencil or crayon lines? Want to create areas of texture? Perhaps you've always wanted to make a print with some of Granny's lacework (and destroy it in the process)? In this class we will explore the possibilities that BIG (Baldwin Intaglio Ground) provides as a soft ground. Peter Graham is our studio tech. He's a painter/printmaker, and must only be fed low sodium, low fat treats! Rapid Transit Peter Graham, intaglio on paper, 5" x 7", 2013. Qu'est-ce que Gabriel faire?, intaglio on paper, 10" x 8", 2012. Late in life Charles came to the conclusion that those who knew him best had been left behind in the Galapagos, intaglio on paper, 18" x 24", 2010. Waiting for the Thaw, intaglio on paper, 7" x 9.5", 2010. The Trapper, intaglio on paper, 24" x 18", 2011. Self Portrait, intaglio on paper, 2010. Quad, intaglio on paper, 8" x 7.5", 2010. Parallax Voyage, intaglio on paper, 12" x 3.75", 2010. Bylot Island, intaglio on paper, 11" x 7.5", 2010. Self Portrait, intaglio on paper, 12" x 16", 2009. Wanderer, intaglio on paper, 12" x 16", 2009. Compound Interest, intaglio on paper, 12" x 16", 2009. Lost, intaglio print on paper, 18" x 24", 2010.